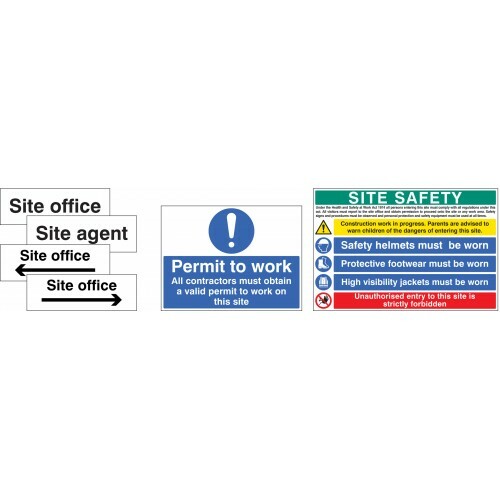 This construction site sign starter pack comprises of six of our most commonly used construction signs and contains a total of seven safety signs: 1 x Site Office. 1 x Site Agent. 1 x Site Office Arrow Left. 1 x Site Office Arrow Right. 2 x Permit to Work, All contractors must obtain a valid permit to work on this site. 1 x Multi-Message Site Safety Board which says: Under the Health and Safety at Work Act 1974 all persons entering this site must comply with all regulations under this act. All visitors must report to the site office and obtain permission to proceed onto the site or any work area. 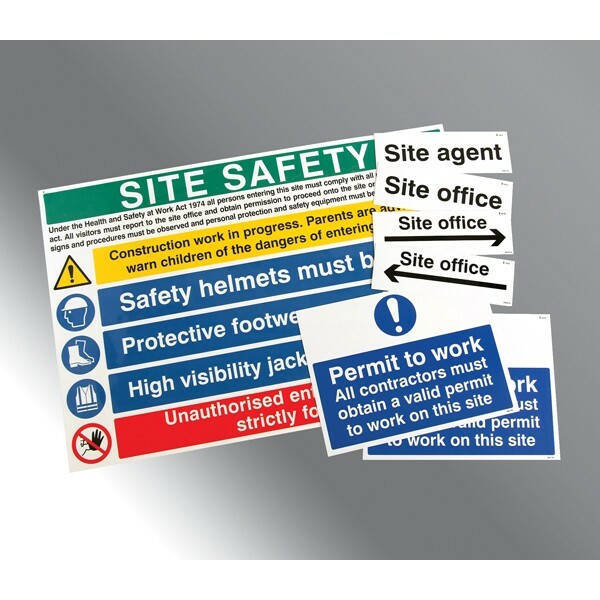 Safety signs and procedures must be observed and personal protection and safety equipment must be used at all times. Warning Message: Construction work in progress, Parents are advised to warn children of the dangers of entering this site. Prohibition Messages: Unauthorised entry to this site is strictly forbidden. Mandatory Messages: Safety helmets must be worn. Protective footwear must be worn. High visibility jackets must be worn.